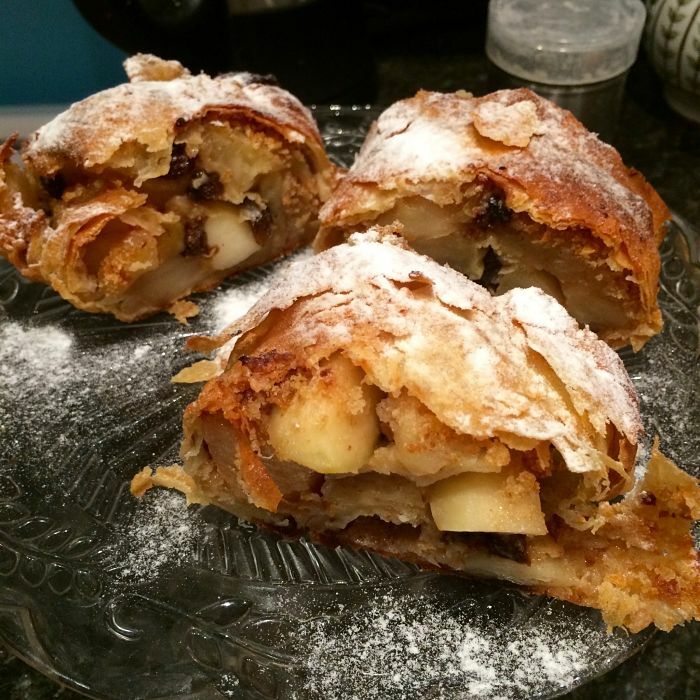 Outside Italy, few know that apple strudel is actually a very Italian dessert and not just a Viennese speciality. You will find it in patisseries all over Trentino Alto Adige, Veneto and Friuli Venezia Giulia, all territories that, historically and culturally, have had strong links with the old Austro-Hungarian empire and (partly) share the same culinary heritage. In Veneto and Friuli dialect it is called strucolo de pomi, whilst in Trentino Alto Adige it is called either strudel di mele or apfelstrudel, its Viennese name. In all these three Northern Eastern regions you can actually find different types of strudel/strucolo: sweet, savoury, baked or boiled. Sometimes they are based on the traditional paper-thin strudel pastry, other times on a yeasted dough or even a potato dough (like gnocchi). 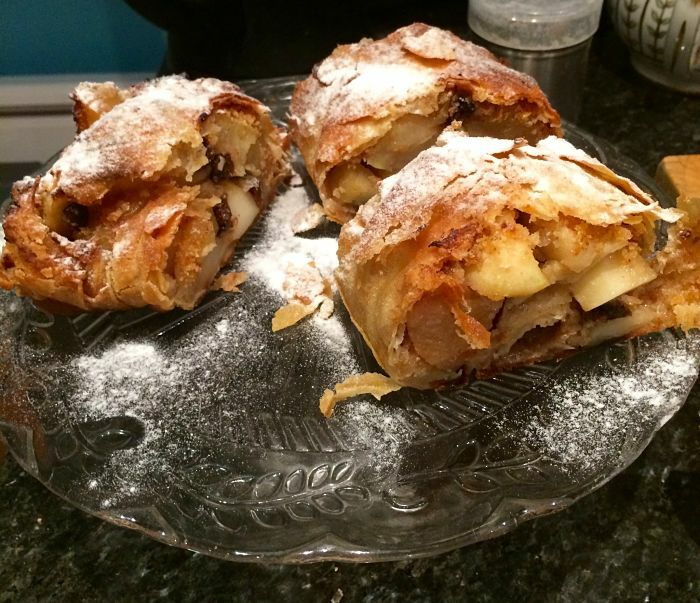 Strudel di mele (apple strudel) is perhaps the most famous: crackling extra-thin pastry enclosing a cinnamon-spiked filling of apples and raisins. You will read somewhere that strudel can be made with puff pastry, filo pastry or pasta frolla (short pastry) – all these are inferior choices, I find. 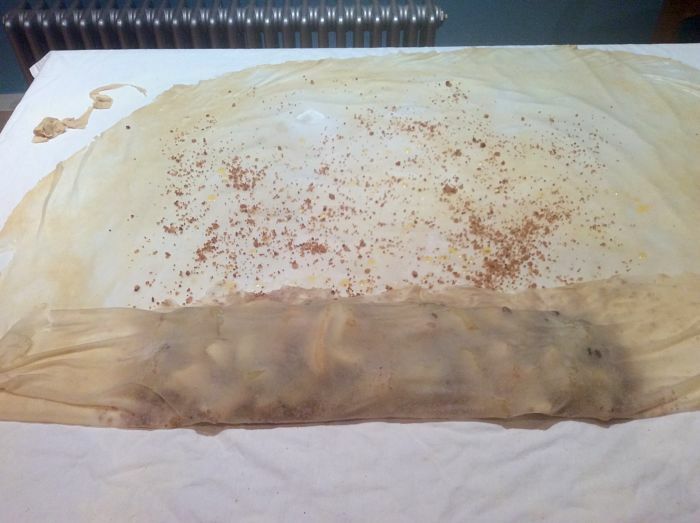 It is only home-made strudel dough, slightly thicker and often richer than filo, that delivers a result that is feather-light and yet substantial at the same time. It is not the easiest dough to handle – it must be pulled by hand until it is almost transparently thin and this requires some practice. The good news is that even if you tear the dough, it is not a big deal – once rolled up, it will not make any difference. As in many other areas of cooking the only way to master this technique is to make it again and again. The traditional filling is made with raw, tart apples, sliced thinly and tossed with grappa spiked raisins, cinnamon and breadcrumbs fried in butter. I prefer those more unusual versions where the apples are first briefly cooked: for some strange reason, the flavour is fuller, more applely and the texture is drier, less prone to make the pastry soggy. Apples that retain their shape after cooking are the one to choose, not Bramley. 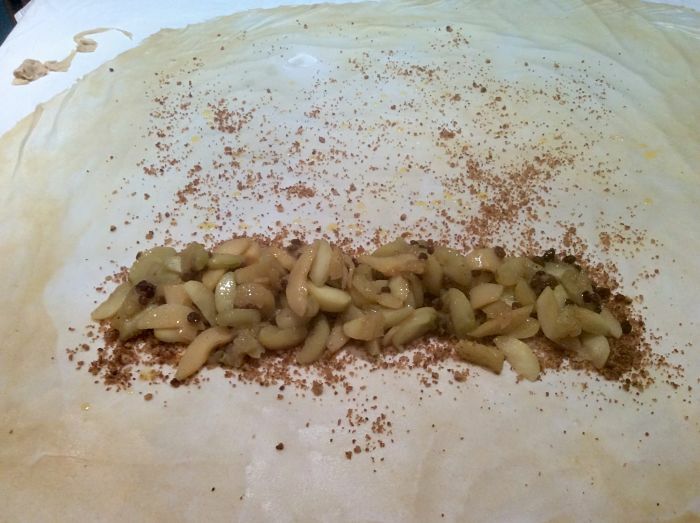 It works better if the filling is made the day before, so that it is completely cold when stuffing the strudel (if it were warm, it would melt the dough). 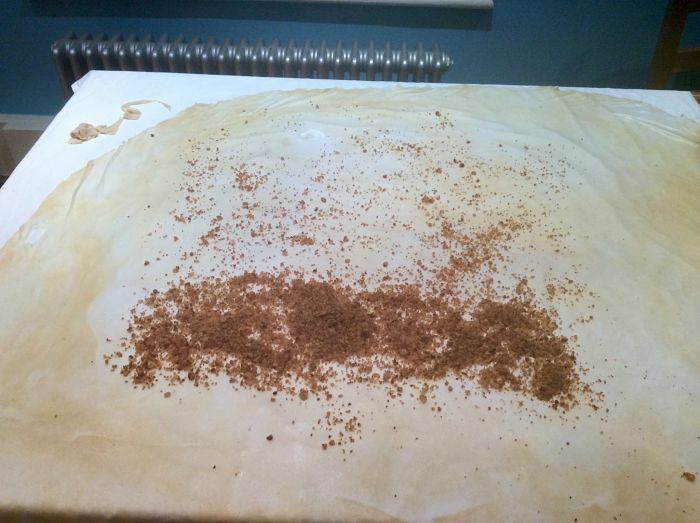 To assemble the strudel you need a large table: the dough should be stretched to about 70 cm x 90 cm. To pull and stretch the dough remove all jewelry and make sure your nails are short. Peel and core the apples. Cut them into thick slices. Place them in a roomy saucepan, with the water, the lemon juice, the salt, the sugar and the cinnamon. Cover and bring the liquid to the boil. Cook on medium for about 5 minutes. Remove the lid and cook for further 5 minutes, stirring gently from time to time. The liquid must evaporate and the apples must not disintegrate. Transfer them onto a tray to cool. Add the grappa-soaked raisins. Refrigerate. Wipe clean the same pan and melt the butter. Add the breadcrumbs and cook until golden, stirring occasionally. Cool and keep aside. The walnuts come into play later on. Mix the egg, oil and 80 ml of water. Place both flours and salt in the food processor. Mix to combine. Gradually add the liquid. Let the dough mass around the blades and let it rest, with the lid on, for about 10 minutes: this is to enable the dough to fully hydrate. Check it: it should be soft and supple, but not sticky. If it feels too firm, add some warm water by the teaspoon and process. If it feels too slack, add a little flour by the teaspoon and process. Knead by hand into a round, place it into an oiled bowl, brushing it with vegetable oil all over. Cover the bowl with cling film and let it rest at room temperature for about two hours. Now it is time to pull and stretch it. 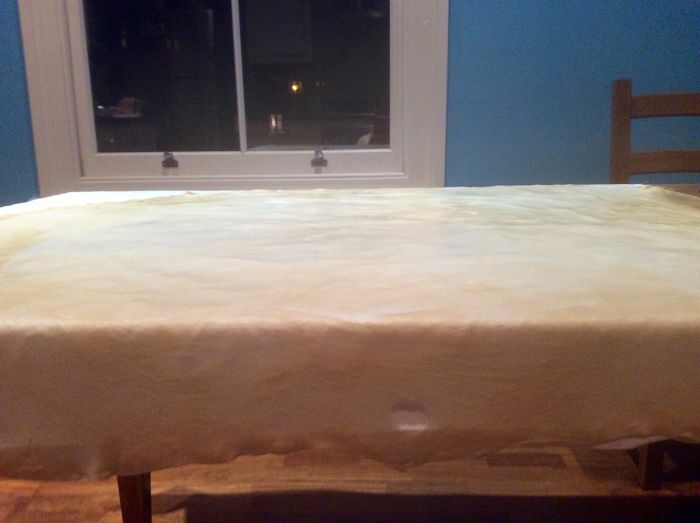 Cover the table with a cotton tablecloth and flour it heavily: I tend to sieve flour over it and then “massage” it onto the cloth. Melt the remaining 100g butter and keep aside. 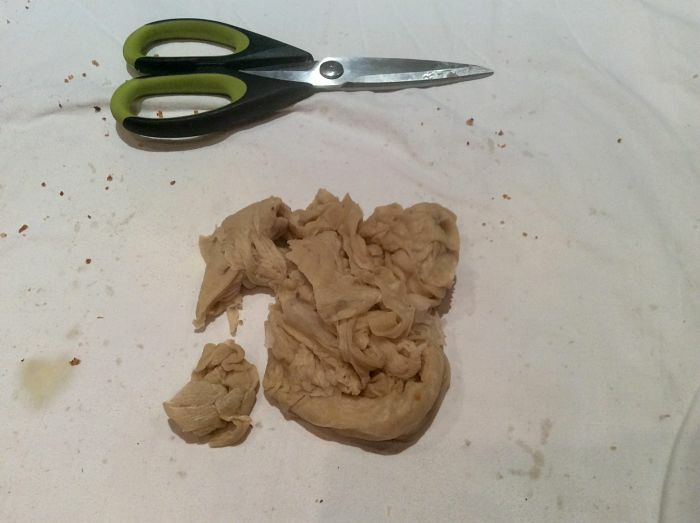 Remove the dough from the bowl and let it fall into the middle of the cloth. 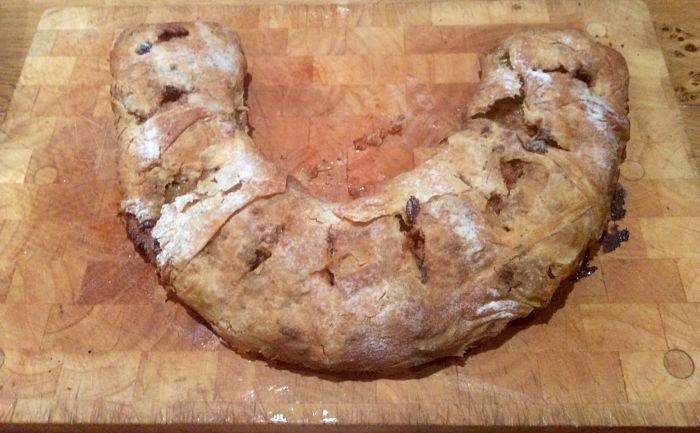 Using your hand, pat the dough into a rectangular shape. Start rolling the dough with a heavy rolling pin, from the centre outwards and sideways, going over the edges. Roll it as thin as you can, making sure it is not sticking to the cloth by occasionally lifting it and dusting the cloth under it with extra flour. Brush it liberally but gently with vegetable oil. Now you can start stretching and pulling the dough by hand. Place your dry, clean hands under the dough, starting from the centre, palm side down and slightly cupped. Pull the dough by gently tugging it outwards. Small, gentle movements are required here. As the dough gets thinner I switch motion and I pull it using my hands palm-up and flat. Have a look at the videos at the end of the recipe and it will be clear. 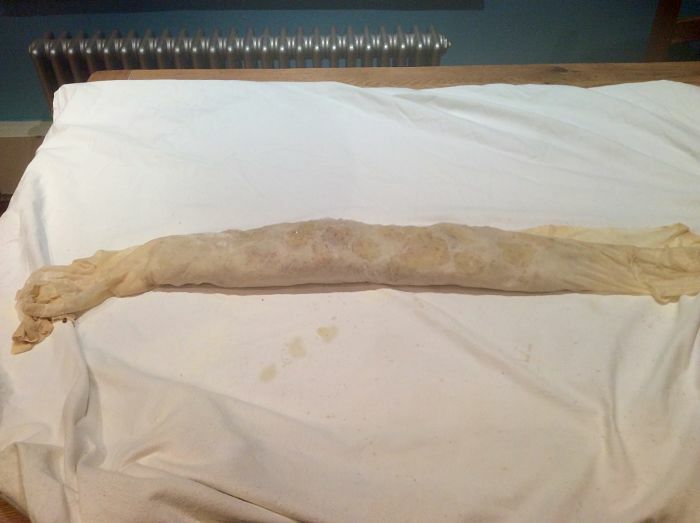 Pull and stretch the dough until it is more or less 70 cm x 90 cm. 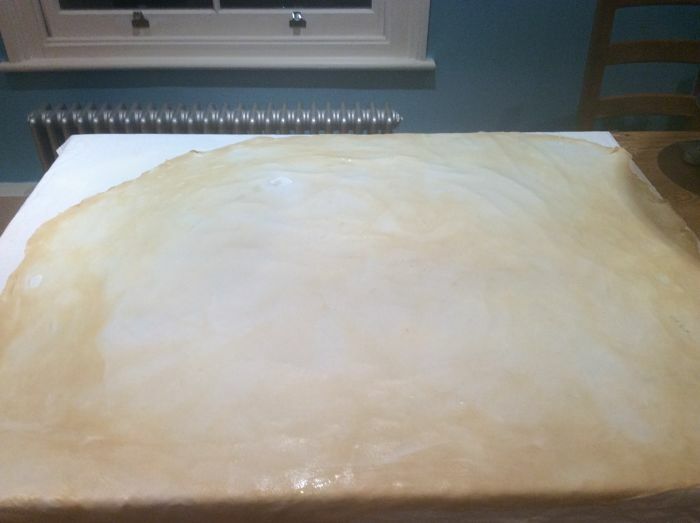 I managed to stretch the dough up to 1 mt x 1 mt a couple of times – beginner’s luck I would say. With the shorter side facing you, scatter three parts of the breadcrumbs onto the dough, about 15 cm from the border and leaving about 10 cm at either sides. The aim is to have a vaguely rectangular shape/bed of breadcrumbs. Scatter over the walnuts. Add the apple and raisin mix. Scatter the rest of the breadcrumbs all over the remaining, empty portion of dough, keeping away from the sides. 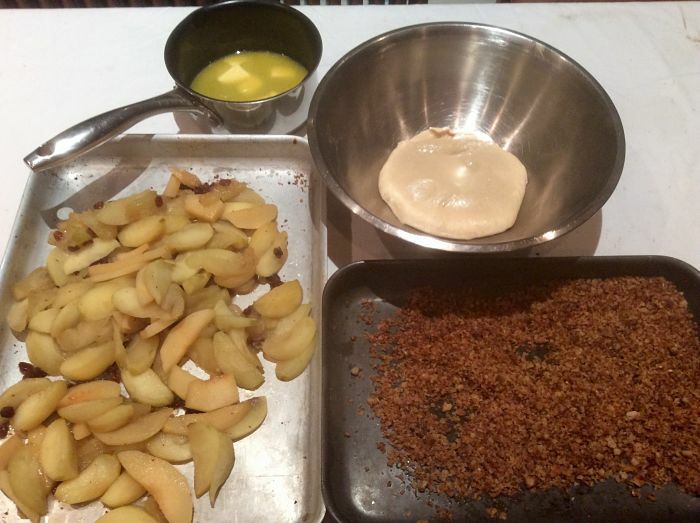 Fold the short lover side over the apples, trying the enclose them all drizzle with some melted butter. Keep on rolling the dough, using the cloth to help you. Drizzle each turn with some butter, but make sure to have something left for the top. Do not worry about the sides, that will look after themselves somehow. When the dough is completely rolled, trim the sides by cutting it with a knife or scissors, leaving about 5 cm of dough per side. You will be left of lots of unused dough and this is OK. Press the dough from the sides to seal it and tuck it under the strudel, like a parcel. You can now gently compact the strudel with your hands.Transfer it onto a lightly buttered oven tray (or one lined with a silicon mat). Brush with the remaining melted butter. Make deep cuts, using scissors and bake for about 30 minutes or until deep golden. 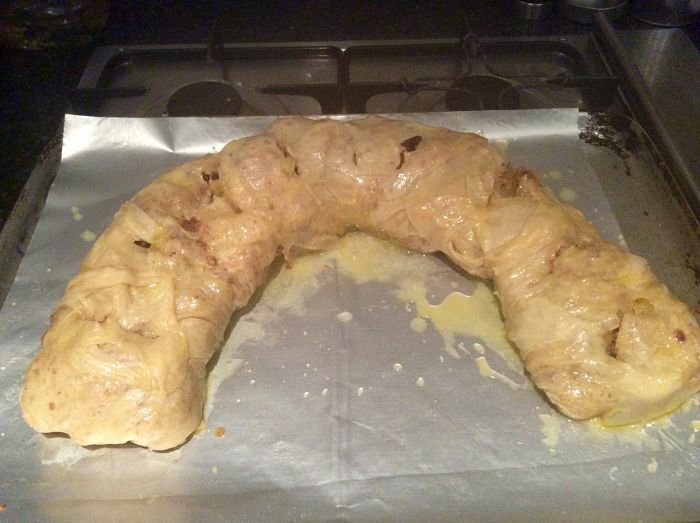 Good that you’re using proper strudel dough. Next time I make it, I’ll try your method of cooking the apples first.